Diese Veranstaltung findet auf englischer und arabischer Lautsprache statt. Bei Bedarf kann während des Q&A Übersetzung in deutsche Lautsprache angeboten werden. The screening will be followed by a Q&A with the director Nahed Awwad. The Jerusalem Airport lies along the road that links Jerusalem to Ramallah. It has been occupied by Israeli army since 1967, at a 5 kilometer distance from Ramallah and 10 kilometer distance from Jerusalem. Today, to the east of the runway, a huge military checkpoint blocks the Jerusalem-Ramallah road, a dead end street. 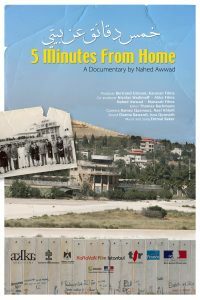 Nahed Awwad discovers that life has not always been like this, and that this sad spot used to be a place where international aircrafts landed in the 1950s and 1960s, when Palestinians traveled freely. The happy images and testimonies of the past contrast bitterly with those of the present where access is denied to the aviation zone that is now being besieged behind barbed wire and soon will be trapped behind the Israeli Separation Wall. Nahed Awwad goes to meet this place, evoking the past in order to have a better apprehension of the present: today’s Palestinian reality that is marked by forgetfulness. World premier: Vision Du Reel film festival, Nyon-Swizerland. Screened at the film market Pavllion Les Cinemas Du Sud- Cannes film festival. The event will take place in English and Arabic spoken language. Nahed Awwad is an independent filmmaker; She has worked with well- known Palestinian filmmakers, local Palestinian TV stations and later international networks. In 2004 she got her film diploma from the European film college in Denmark and has released eight documentary films between experimental, short and feature length. Awwad’s films were screened at various international film festivals, including HotDocs film festival, Canada 2013, Dubai international film festival in 2012, Vision du Reel Film Festival, Nyon, Switzerland in 2005 and 2008 and the Cannes Film Festival in 2008 (Cinema Sud). In 2009 she was granted the International Trailblazer Tribute -Middle East Trailblazer in MIPDOC. اللغة عربي مع ترجمة للأنجليزية. يقع مطار القدس على طريق القدس – رام الله والذي تم احتلاله من قبل الجيش الإسرائيلي سنة 1967 على بعد خمس دقائق من رام الله و10 دقائق من القدس. أما اليوم، فيوجد على نهاية مدرج المطار من الشرق حاجز قلنديا العسكري والذي يفصل طريق القدس-رام الله فبات نهاية طريق مسدود. تكتشف ناهد عواد أن هذا المكان الحزين لم يكن دوما كذلك، فقد كان يوماً يستقبل طائرات من كل أنحاء العالم وخصوصا من الوطن العربي وبشكل يومي في الخمسينات والستينات، وذلك عندما كان الفلسطينيون يسافرون الى العالم بحرية. تتناقض الصور القديمة للمطار بشكل واضح ومؤلم مع واقع المكان المرير المحاصر تماما بالشيك وقريبا سوف يتم تطويقه بجدار الفصل العنصري الإسرائيلي. تعود ناهد عواد لهذا المكان لتستحضر ماضيه المشرق في محاولة لفهم وسبر حاضره والهروب من واقعه الأليم اليوم. العرض الأولي العالمي: مهرجان سينما الواقع في نيون –سويسرا. وفي سوق الأفلام بفيليون لس سينما الشرق- في مهرجان كان السينمائي.